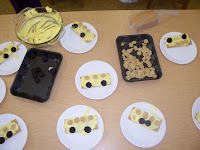 This week we concentrated on yellow. These guys are good. My poor color box took quite a beating with the number of yellow items they found. We also had some nature in our color box as I found some yellow leaves and some yellow flowers to put in before I got there. I had brought in a lemon and banana too. Yellow is most closely related with the sun, so we have our yellow and talk about that big, bright sun in the sky. To experience yellow, we water colored a lemon, banana, and corn. Then we had some yellow Play Doh, and our favorite thing was the yellow school bus. The kids had a great time with the bus, mostly because it had the sugar count of a full field of sugar cane, but it's always fun to make food. I put the ingredients for the bus in Kitchen Fun. Our yellow snack was pineapple. I must say, I loved the pineapple, but not a large favorite among the children. Then for our color book we colored a yellow sun and used our color dots to make tropical fish. Yellow is a great color--one of my favorite. The class looked so bright and fun on Thursday when we all wore yellow to school. Great fun!